This entire semester while I have been studying abroad in Israel I have been spending a great deal of time reflecting on who I am and who I want to become some day. In particular I have been focusing and developing my Jewish identity and trying to figure out where I am Jewishly and what is important to me. I have learned that college has been a time for me to really spend time reflecting on these kinds of things. Being in Israel in particular, has really lead me to discover new things about myself. While studying Kabbalah this semester, I have tried to really connect what I have been learning to my daily life. For the purpose of this paper I am going to discuss the different Sefirot in Kabbalah and see how they relate to my own Jewish experience, personal growth and development of my Jewish identity. First of all what are the Sefirot? According to chabad.org, “Everything that happens in the spiritual world takes place through the medium of the Sefiort.” I am personally connected to Judaism in a very spiritual way through song, dance, and deep mediation, and because of this I felt that connecting my Judaism to the Sefirot would be fitting for this paper. 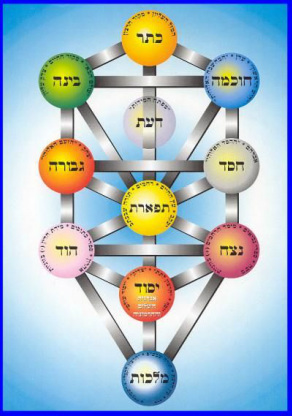 The Sefirot can be described as “ten modes or attributes through which G-D manifests himself” (Dubov). The word Sefirah can also be related to the word to “express” implying that the Sefirot are used to express certain attributes. Since the Sefirot are a reflection of God, they are also often reflected in human’s spiritual make- up and this is why I see myself as connecting to them (Dubov). The first Sefirah is Keter, which literally means “crown”, and because of this it is often associated with the head or skull. It also has to do with “beyond knowing.” Because of this I can relate it to my Jewish traditions. The things that I do in my Jewish daily life are because of the traditions that my family has kept for many of years but I find at times that I really don’t actually know why I am doing these things. It is “beyond my knowing” in a sense. According to the piece The Palm Tree of Deborah, “This quality depends chiefly on the head, for the proud man lifts his head upwards while the poor man lowers his head” (Cordovero, 70). This Sefirah is about “knowing” and this relates to my Jewish identity because once again in my life I do all these things that I do without understanding what they are and I don’t have an answer to why I am doing them. Because of this I have tried to start learning more in depth about Judaism in order to get a better understanding of why I do certain things. I also want to be able to eventually form my own decisions about where I want to be Jewishly. I am a Jewish studies major at my university and also am getting more involved in different Jewish learning programs at my school. Through these types of programs I am learning a lot about Judaism and therefore finding it easier to connect and understand why I do what I do. Keter also has to do with “eheye” which means “I will be” and it connects with the “will to create”. In my current place in life I am really discovering where I will be Jewishly and where I am going in the future. Keter is important in forming a Jewish identity since it is at the top of all the sefirot and “stands above all the other Sefirot, like the crown stands above the head” (Dubov). The next Sefirah is Chochma, which means “wisdom.” Wisdom connects to my Jewish identity because of the wisdom I have learned from others throughout the course of my life. It has impacted me greatly to who I am today. The strongest impacts in my life were the wisdom that I gained from my grandparents and parents. Judaism was always something so important to both sets of my grandparents and because of that they instilled it into my parents who then passed that wisdom on to me. In particular, my Israeli grandparents were Holocaust survivors and after everything they went through they came to Israel and formed a new life for themselves. Being Jewish and having Jewish and Israeli pride was without a doubt a really important thing to them. They really tried hard to pass onto me everything that they knew and to show me how important Judaism is. These people taught me many values that I carry with me today including; honesty, kindness to others, the importance of family, and tradition. According to chabad.org the Sefirah of Chochma, “produces the original idea, and it is often referred to as the first flash or intellect” and it is “everything in potential” (Dubov). It is also the “idea to create," which relates to how my grandparents and parents impact has laid out a certain path for me for what my future would be like. If I didn’t have these people impacting my life Jewishly, I wouldn’t have an “idea to create” or know anything about what I want out of Judaism. These people are significant because through their wisdom they have impacted my journey and are my inspiration for everything I do. The next Sefirah is Binah, which means “understanding.” According to chabad.org, “Binah takes the original idea and expands and develops it both in breadth and depth” (Dubov). It also takes chochma and finds a way to expand on it, clarify it, and make it more comprehendible (Dubov, Ribner, 41). In order to form a better understanding, there is also a “plan to create” within Binah. Through the years, I have been going through many different things in my Jewish identity and really trying to figure out what I am on my own. Since I have gone to college I have realized that now I have the independence to grow on my own and discover what I want out of my life. It is during my first few years of college that I discovered that I want to become more observant. I started keeping Shabbat, keeping stricter kashrut etc. and so now I feel that I am on a “plan to create” how observant I want to be in the future. I have felt that in this way I will also have a better “understanding” of myself and of my Jewish heritage. While I have been in Israel, I have been struggling with this and trying to figure out what I want to do but it has turned around and allowed me to see that being observant is important to me. I still am unsure exactly where I am going with this but I am on some sort of plan. I have taken all that I have learned through the course of my life and applied it here to what I want to do (Dubov). The next Sefirah is Chesed, which is the attribute of loving-kindness or abundance and it is seen as “love that has no boundaries, definitions or limitations” (Ribner, 41-42). Chesed is often associated with doing for others, “At root, everyone is connected to everyone else through chesed. This is the reason that we must show kindness to each other” (Haber and Sedley, 21). It is also considered the “purpose of creation” (Haber and Sedley, 21) and according to Judaism we were put on this earth for a purpose and that is to repair the word, do good in it, and spread this loving-kindness. By doing good in the world we benefit others but we also benefit ourselves and can better connect to God (Ribner, 42). This attribute is often associated with the Patriarch Abraham since he himself was a man of chesed and “his tent was open on all sides and he extended the warmest hospitality to all” (Dubov). I feel that in my spiritual and Jewish growth I am like Abraham in a way, trying to pass on my Jewish tradition and showing its importance since I want to be a Jewish educator some day. I am also like Abraham since one of the most important things I have learned growing up is the importance of “Tikun Olam.” I have lived my life doing this by helping others, whether it be friends or family or by doing volunteer service in my community. I have volunteered in schools in Israel and absorption centers helping children and I even went to Miami during my Spring Break last year to help the communities there on a school community service trip. This coming year I am hoping to plan one of these trips and take a group of my peers into another community to do community service. I have also staffed many youth group conventions as a volunteer and have become very involved in Hillel because I see that I want to help out in any way I can. As I said before, I also want to be a Jewish educator some day because I want to impact Jewish youth and one of the main things I will engrain into my students is this idea of helping others. I live my life wanting to make a difference and do something physically that will change the world. Giving is something so important to me in my growth as a person and because of this I think that the attribute I most connect with is Chesed. The next Sefirah is Gevurah which is the “attribute of restraint” or “strength” (Dubov). According to Sefiros, “Gevurah sets boundaries and limits. It gives definition to the world and to a person’s life (Haber and Sedley, 39). This connects to my Jewish path because my life has been defined by things I do and don’t want to do Jewishly. I have very concrete beliefs about Judaism and I know that I will have restraint when it comes to certain things. One of my main restraints is that I hold myself back from becoming religious too quickly before I figure out what I really want. It is a process and for now I am satisfied with how I am but at the same time eager to know more. There are many things I grew up with in my own Jewish home that I believe in and changing those beliefs is hard for me. I fear the unknown and changing the way I live my life. I know for example that although I am becoming more religious I am still very egalitarian and it is hard for me to attend synagogue services where women do not have an equal part as men. I don’t know if this opinion will ever change for me but for now this is restraining me from going “all the way” in a sense and becoming orthodox. Gevurah is also about “judgment” and I find myself always judging myself and the ways that I have changed (Haber and Sedley, 39). I am also constantly worried about how others judge me since I grew up one way and have been creating for myself a completely new way of living my life. In the end it is the “strength” that I have that makes me realize that what I want to do is ultimately my decision and no one else has room to judge. The next Sefirah is Tiferet, which means “beauty, harmony, and compassion” (Ribner, 44). This relates to me trying to figure out what it is that I find “beautiful” in Judaism. For me it has to do with spirituality and really finding a connection with God through singing, dancing, and meditation. Tiferet is supposed to be the balance of Chesed and Gevurah and this relates to my life because I constantly have to know my own balance of what I should be doing for me and what I should be doing that I was taught by my parents. I have to learn to balance my own beliefs with the values I was raised with. I have to find for myself what gives me meaning in Judaism and follow that instead of what others believe. Tiferet is also known as truth and “truth is clarity that comes when disparate facts come together in resolution” (Haber and Sedley, 57). I have to find for myself reason and truth for what I believe and not let anyone else influence me. The next Sefirah is Netzach, which means “victory” or “eternity”. It comes from the word “menatzeach” meaning to conquer or overcome (Dubov). This relates deeply to the Jewish identity crisis I have been having since I entered college. I am trying to overcome this crisis and figure out what will give me the most meaning in my life. I am in a place for the first time that I am able to make decisions for myself and that scares me. I am trying to overcome this identity crisis by really learning more about Judaism and trying out things to see what is best for me and fits best into my life. According to Sefiros, “Netzach gives the long term view. It sees events as part of a much bigger story” (Haber and Sedley, 74). This is applicable since I am really focusing on myself and what about Judaism will give me the most meaning and this will help me in the long run as a grow and develop myself as a person. I have a vision of what I want my long-term view to be. I know that I want to be Jewish, I want to marry Jewish, raise Jewish kids, I know that I want to be shomer Shabbat, and I know that I want to make aliyah some day and raise my family in Israel, the land of the Jewish people. Even though I have a vision, I have had many questions along the way and have faced challenges that interfere with the whole picture but I have slowly been able to overcome them. The next Sefirah is Hod, which means “splendor” (Dubov). According to Sefiros, “Hod focuses on the present at the expense of the future. But ultimately it is not only temporary. Hod forces us to deal with the beauty of the moment in the context of eternity” (Haber and Sedley, 92). Hod and Netzach together are supposed to be like the right and left legs, which shows the ability to be grounded (Ribner, 44). In connection with my Jewish identity, I feel very grounded in my Judaism, in the sense that I know that this is the religion I want to be a part of and devote my life to it. I have no interest in pursuing other religions. I grew up with Jewish values in a traditional Jewish home, went to Jewish private schooling all my life, am now a Jewish Studies major, and eventually want to go into Jewish work. I know that in the moment I know how I want to lead my life. My present is impacting my future since I am so grounded. Hod also stems from the word “Hodaah,” in Hebrew, meaning to thank, admit, or submit. It is about total submission and being accepting (Dubov). In my Jewish life I have to be accepting of the Jewish identity crisis that I constantly have. Although I am grounded in the sense that I know I want to be Jewish, I have not fully figured out where I want to go with my Judaism and how observant I want to be. I have learned though to accept or “admit” that I am in the middle of a crisis and I am just going to learn more about myself through the process. Hod is also often associated with choice because “any choice can only be for the moment. Just like Hod, free choice focuses on the present…” (Haber and Sedley 92). There are choices that I have to make and one of the main choices I have made was to remain and continue to be Jewish. Hod, I think, represents my Judaism very well because it is about making choices, accepting choices, and finding the beauty in my decisions and being thankful for them. The next Sefirah is Yesod, which is the “foundation” (Ribner, 44). According to chabad.org, “Yesod acts as a funnel through which all the previous Sefirot are channeled” (Dubov) because it is the foundation. Yesod gives us the ability to confront reality and it is the means by which all the other sefirot interact with the world (Haber and Sedley, 110). This relates to my Jewish identity since the basis and foundation for my entire Jewish experience has been my relationship with the land of Israel. I grew up with an Israeli father who spoke Hebrew to me at home and I had a lot of Israeli culture integrated into my childhood. I have spent almost every year of my life being in Israel with friends and family for extensive amounts of time. I have come back now to study here and have plans to make aliyah after I graduate university. All of these life experiences and having been to Israel so many times in my life have created for me a deep connection and bond with this land and has shown me why my Judaism is so important to me. Every time I have come back here I have gained more and more knowledge about the land, its people, and the history. I have felt so connected to Israel because of the Jewish history and this has led me to everything else I have done in my Jewish life. Yesod is said to be represented by Yosef who laid down the foundation for the Jewish nation, which was created in Egypt (Haber and Sedley, 110). Just like Yosef, I have used my passion and love of Israel to lay the foundation for me for everything I have done in my life. My deep connection with the country lead me to be involved in Jewish organizations in both high school and college and to want to purse a career in the Jewish community in Jewish education in order to make an impact on the Jewish future. Yesod is significant in my life because the foundation is what made me what I am today. The last Sefirah I will discuss is Malchut, which is “kingship” (Dubov). Malchut is said to be different from all the other sefirot because it doesn’t focus on one single aspect, but rather on the picture as a whole. It is known as the “receiver or recipient of influence from the higher sefirot” (Dubov). Malchut can often be associated with the mouth (speech). It also has to do with the last stage of creation which applies to me because I have taken everything I have learned through the course of my life and have learned how to apply it (or speak it) to my own Jewish life (Dubov). I have taken the whole picture of what I have learned and formed what I want my future to look like. Since I am still in the process of developing my Jewish identity, I am not fully at the “last stage of creation”; however, there are many things that I do know about myself because of the “big picture idea.” I know that I want to be Jewish, that I want to marry Jewish, I want to have a Kosher and Shomer Shabbos home, I want to raise Jewish kids, I want my kids to attend Jewish schools and summer camps and I want to be actively involved in the Jewish community. These things I do know but beyond that it is still a bit unclear. Since everything is still unclear, I have to learn to further develop the other Sefirot in order to figure out how I connect to Malchut since “the other sefirot are the realization of the idea and Malchut is what makes it work” (Haber and Sedley, 128). In general there are many things within my Jewish identity I need to work on and by going through these sefirot I have come to the realization that although there are some things about my Judaism that I know, there is so much room for me to learn and grow. According to chabad.org, “Sefirah is related to the verb l’saper, which means ‘to express’… this implies that the function of a Sefirah is to express a certain attribute” (Dubov). The sefirot have helped me express what is important to me in my Jewish experience and where I have room for potential growth. Hopefully some day I will be able to really develop each of my “sefirot” and have more of a picture of what my “Malchut” should look like. Cordevero, Moses Ben Jacob., and Louis Jacobs. The Palm Tree of Deborah. New York: Sepher-Hermon, 1974. Print. Dubov, Rabbi Nissan Dovid. "The Sefirot." The Principles of Kabbalah. Chabad.org, 2007. Web. 13 May 2012. <http://www.chabad.org/library/article_cdo/aid/361885/jewish/The-Sefirot.htm>. Haber, Rabbi Yaacov, and Rabbi David Sedley. Sefiros: Spirtual Refinement Through Counting the Omer. New York: TorahLab, 2009. Print. Ribner, Melinda. New Age Judaism: Ancient Wisdom for the Modern World. Deerfield Beach, FL: Simcha, 2000. Print.